The compact Heritage-100P is a lightweight and convenient grab-and-go scope. 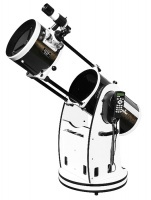 With its quality 100mm f/4 parabolic optics, it can be used to view the Moon and bright planets and also has enough light gathering for the observation of star clusters, bright galaxies and nebulae. These instruments offer an incredible aperture-to-price ratio. The Dobsonian mount, popularized by John Dobson in the late 1970's, is a very simple but effective method of mounting a Newtonian Reflector, based on the alt-azimuth principle. 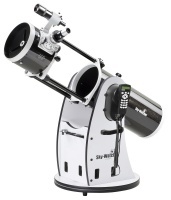 One of our most popular Dobsonian telescopes because it is generally considered to be the largest aperture solid tube Dobsonian that can still be comfortably setup and moved around the garden single-handed. Combining the power of a large optical tube, the portability of the patented collapsible FlexTube design and SynScan computerised Go-To technology.